I've been working on a butterfly printed shirt I purchased a while ago for $4 from St Andrews Op Shop in Brighton. An interesting one, for it is, believe or not, a man's shirt by fashion label English Laundry. It amazes me that someone originally bought this shirt at all, for a women, maybe, but for a man? Surely not. 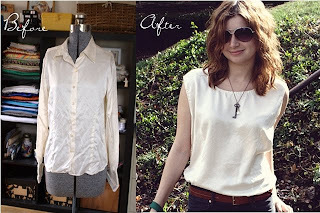 Inspired a little by this silk shirt refashion by one pearl button.. Using my cherry shirt as a rough guide for cutting to appropriate size.. I had to include a small clasp right at the top of the (new) back of my top, to stop it gaping were the collar had been removed.. Unfortunately, I have created a sleeveless top for the wrong season, for Melbourne's autumnal weather brings cooler temperatures, therefore I have to wear with a long sleeve top underneath till warmer weather returns. In an attempt to minimise any waste, I am working on a few projects to use up the excess fabric from this shirt, which I will blog about once complete. If you add in slim darts from under the bust about 10cm in lengthe that will give it more shape. Just put the top on inside out and pin them to fit, easiest way to get them right. What a cool transformation! I love the idea of having buttons down the back, it just seems so lady like. Maybe because it reminds me of lace-up back corsets! Not sure. But it looks great! Hey Erica what an awesome find...loving the beautiful butterflys:) darts aren't too scarey...just pop your top on inside out & pin to fit.